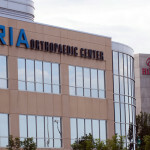 Healthcare Technology Corporation teamed up with Kraus Anderson Construction Company and Perkins + Will Architects to supply Accu-Mount Support Systems for the state-of-the-art TRIA Orthopaedic Center located just outside of Minneapolis, MN. Accu-Mount Support Systems were specified for all five (5) outpatient surgical suites as well as for the ceiling-suspended boom and lighting equipment installed in the sophisticated Bio-Skills laboratory. Multiple mounting unit arrangements were provided to accommodate the varying construction methods within the building. The Accu-Mount Support Systems eliminated the need for on-site welding and fabrication and ensured that the equipment suppliers’ stringent deflection requirements would be maintained.